WITH THE VRX DIRT BIKE HELMET BY VEGA HELMETS YOU DON'T HAVE TO SACRIFICE SAFETY, STYLE AND QUALITY FOR PRICE. The new 2017 VRX Off-Road Helmet is the ideal choice for any off road rider with its proven design, reliable coverage, comfortable fit, and maximum value. The VRX full face helmet will ensure that you stay safe and feel as cool as you look, featuring a multi-channel air flow system, fully removable max-flow comfort liner, and thick high density EPS with strong polycarbonate shell. ; Multi-channel air-flow system with fully vented EPS keeps you cool. ; Equipped with a multi-position removable and vented visor. ; Padded D-ring strap system with snap. ; Full face design with large clear-view eye port, true to size fit, and even weight distribution. ; Smooth, glossy shell with off-road graphic design. ; Washable, replaceable max-flow plush liner will keep you riding in comfort. ; Lightweight shell weighs only 3.2 pounds eliminating neck fatigue. ; DOT and ECE approved helmet offers world class protection at an affordable price. ; Every batch of helmets are randomly tested to ensure safety standards are met. ; 5 year limited warranty and guaranteed to be free from defects in materials and craftsmanship for the lifetime of the helmet. - Small: 21.65" - 22.05"
- Medium: 22.44" - 22.83"
- Large: 23.23" - 23.62"
- X-Large: 24.02" - 24.41"
The VRX is in stock and ready to ship. Get yours today. The VRX Dirt Bike Helmet by Vega Helmets is a value packed off-road helmet loaded with technology at a price that won't break the bank. 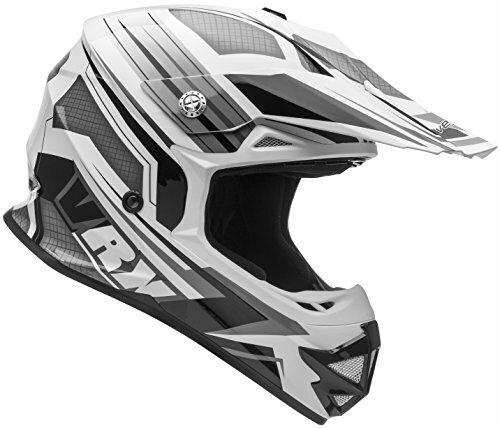 TECHNOLOGY - The VRX Full Face Helmet features an advanced polycarbonate ABS shell, a multi-channel air flow system, high density fully vented EPS, padded D-ring strap, fully removable multi-position visor and washable / replaceable max-flow comfort liner. COOL & COMFORTABLE - The VRX is lightweight, perfectly snug, and incredibly breathable to ensure you stay cool and comfortable while dirt biking, riding your ATV, MX, Motocross, Enduro, Quad, and any other off road sport. SAFE - The VRX Helmet meets or exceeds US DOT standard FMVSS 218 and ECE R 22.05 and is engineered with a thick, high density fully vented EPS liner to greatly absorb impact, limiting the amount of force transmitted to your head. 5 YEAR WARRANTY - Your VRX Off-Road Helmet is backed by our industry leading 5 year warranty. If you have any questions about this product by Vega Helmets, contact us by completing and submitting the form below. If you are looking for a specif part number, please include it with your message.